The month of May is one of my favorites, thanks to the occurrence of Zoo-To-Do, Mothers' Day, graduations, Cinco De Mayo, Memorial Day, and the New Orleans Wine and Food Festival. These holidays and celebrations bring together the things I enjoy the most, food, family, drink, and fun. This month, there's something to look forward to at the end of every week! When it comes to the racing calendar, the month of May is also jam packed. The below lineup includes multiple races each weekend, plus several more on weeknights. The weather will be great as we still have some cool evenings and early mornings of which to take advantage, so get out there and enjoy it! 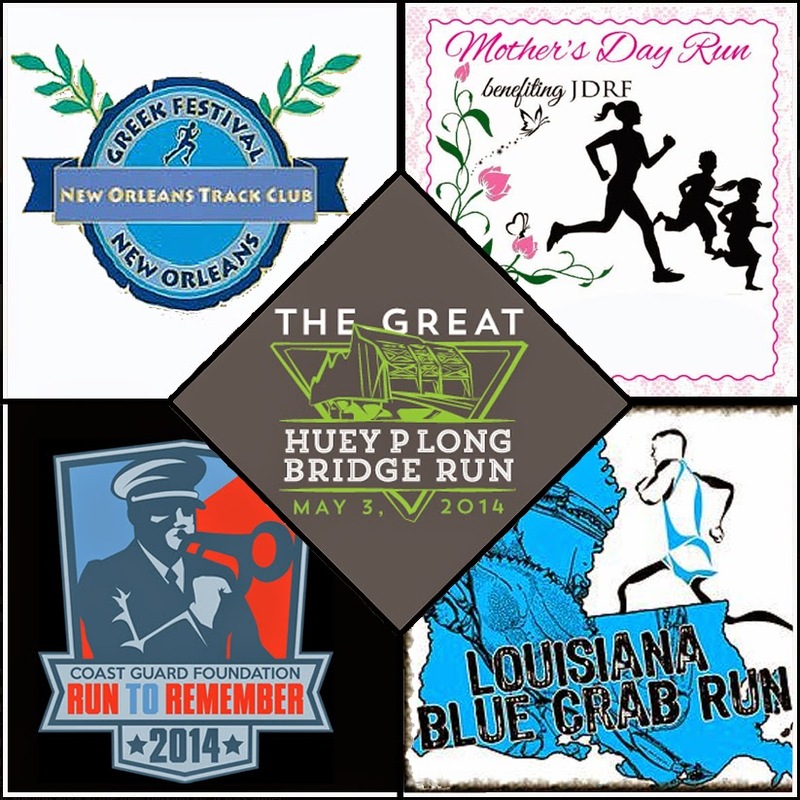 Huey P. Long Bridge Run 5K (Saturday, May 3rd @ 8am) - The second race in the Louisiana Bridge Run Series comes to Jefferson Parish with this event. Pre-race packet pickup and registration is available on Friday afternoon under the bridge, and again on race morning. The first 1,500 finishers who #GeauxOverIt receive custom pint glasses. Crawfishman Triathlon (Sunday, May 4th @ 7:30am) - Held in a private subdivision in Bush, Louisiana, the annual triathlon will see nearly 400 athletes swim, bike and run on a fun and hilly course. Q50 Cinco De Mayo 4 Mile Trail Run (Sunday, May 4th @ 8:30am) - A 2 loop course around the trails of Audubon Park, concluding with Tamales after the finish. Run For Home 5K & 1 Mile (Sunday, May 4th @ 8:30am) - Rounding the bases and finishing at home plate in Zephyr's Field make this race a home run! All participants receive a free ticket to a Zephyr's home game, plus numerous prizes being awarded by random drawing. CGF Run to Remember 5K (Saturday, May 10th @ 8am) - The Coast Guard Foundation Run To Remember is a worldwide movement. The NOLA event benefits the Fallen Heroes Scholarship fund, which gives money to dependents of guardsmen who have fallen in the line of duty. Girls on the Run NOLA Spring 5K (Saturday, May 10th @ 8am) - The organization that empowers young female athletes hosts this semiannual spring 5K in City Park. Mother's Day Run 2 Mile & 1/2 Mile (Sunday, May 11th @ 8am) - This co-ed race celebrates maternal figures with team awards present to the fastest mother / son or daughter, plus grandmother / grandson or granddaughter teams. An added incentive for mom is a rose at the finish line. NOTC Cross Country 2 Mile (Wednesday, May 14th @ 5:45pm) - Experience the sport of Cross Country on the City Park Course. Entry fees of $5 for NOTC members / $10 for non-members make this the best deal of the month! Tchoupitoulas Barathon 6 Miles (Friday, May 16th @ 6:05pm) - 6 Miles. 6 Bars. 6 Beers. Over a thousand runners sprint from bar to bar through Uptown New Orleans consuming beverages before heading to the finish and claiming an official Finisher's Koozie. Louisiana Blue Crab Run 5K & 1 Mile (Saturday, May 17th @ 10am) - 100% of race proceeds go to Louisiana wetland restoration & awareness. Post race festivities feature a crawfish boil, beer and music on the shores of Lake Pontchartrain in Kenner. Zulu Run to Ride 5K (Saturday, May 17th @ 8:30am) - Starting and finishing in downtown New Orleans, the highlight of this race is the raffle drawing for a free ride in the 2015 Zulu Mardi Gras Day parade! Unique Zulu Awards will also be presented to top finishers. Greek Festival Race 5K & 1 Mile (Friday, May 23rd @ 7pm) - Another race in the NOTC Grand Prix Series takes runners up and down Bayou St. John. Cool socks for all pre-registered entrants, along with free entry to the Greek Festival all weekend for race participants. Victory 5K & 1/4 Mile (Saturday, May 25th @ 8am) - Anytime Fitness hosts this race at Joe W. Brown Recreation Center Victory Track in New Orleans East. Fat Boy 5K (Saturday, May 31st @ 8am) - Bigger is better for the Fat Boy 5K, where weight division awards are top prize. All 5K finishers receive donut medallions, and will enjoy a post-race party filled with chocolate milk, pizza, moon pies and more.